I was looking for a sewing machine a few months back that was not just affordable, but also feature rich. However, my search turned out to be a difficult prospect. Sewing machines with lots of features were pricy, while cheap sewing machine did not have enough features. But after some time searching, I stumbled upon a sewing machine that was not just affordable but also was packed with a lot of features. I was so satisfied that I bought the Brother CS6000i Sewing Machine. Here, I will list some of the features that make this a gem of a sewing machine offering excellent value for money. The Brother CS6000i is a feature rich sewing machine that is perfect for beginners. Even those who had never used a sewing machine will feel at ease in using the machine right out of the box. The machine is durable with a quality build. It has also a large variety of settings and stitches. This machine has seven buttonhole styles and one-step button hole. The consistent stitches ensure that the sewing machine performs without any problems. There is also a wide table attachment and presser feet. One of the best things about this sewing machine is the stitch performance. You can fill a bobbin in under a minute and thread the machine in just 10 seconds. The only con that I find of this machine is that there is no automatic embroidery function. Other than that, this is one solid machine with lots of features. Brother sewing machines are renowned the world over for their quality and value for money. The company was started way back in 1908 as a family business specializing in sewing machines. The company has set the standard for innovative and affordable sewing machines. The sewing machines had a humble opening with the first machines designed for making straw hats. Since 1954, Brother sewing machines are serving the needs of residential and industrial owners all over the world. The sewing machines are recognized as the industry leader in many places including the US and Japan. What’s best about Brother sewing machine is that they had been at the forefront of introducing innovative machines. The company had launched the first electronic sewing machine in 1976 that set a whole new era of sewing manufacturing in motion. The company had launched the first embroidering system – the PC-7000 in 1991. This was followed by the first embroidering software, PE-Design, in 1996. Fast forward to today, the company is still considered a pioneer when it comes to innovative sewing, quilting, and embroidery machine. What I find fascinating about Brother sewing machines is that they are best for both beginners and experts. 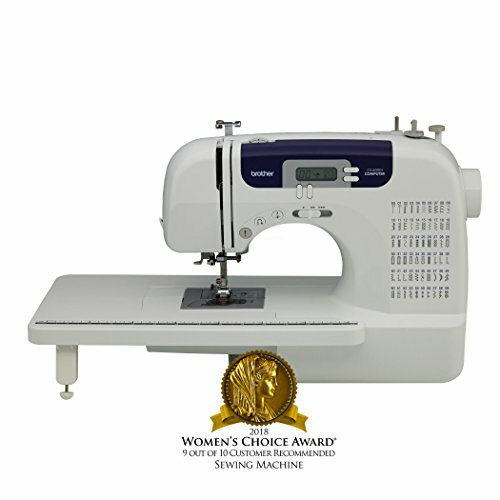 Brother embroidery and sewing machines had won the Consumer Digital Best Buy award in 2013. The sewing machines made by the company also have high star ratings in Amazon. The long-standing reputation of Brother as a leading sewing machine influenced me in buying the Brother CS6000i Sewing Machine. This machine has won the 2018 Women’s Choice Award and attracted 4.4 out of 5 stars in Amazon. I was fascinated by several features of the sewing machine. Here are some of the reasons that I recommend this sewing machine for all stitching and quilting needs. The sewing machine is simple and easy to use. Both novice and professionals will feel at ease using the machine. Most users like the LCD screen that displays the stitching mode. The instruction manual is easy to follow. You can start using the advanced features of the machine. I found the machine to be surprisingly lightweight. It’s easy to move it from one table to another. While some say that the light highlighting the sewing area could be brighter, but I found the light to be fine. One thing to note about this machine is that it doesn’t have a memory function. This means that the last stitch setting will be erased when you turn off the machine. But you can easily set the desired stitch settings with a few clicks of the button. The computerized operation makes it easy to use the machine with better performance. A great thing about the sewing machine is that it starts and stops with a push of a button. You won’t have to use your leg or hand to use the machine. The performance of the CS6000i sewing machine can be best described by one term ‘workhorse’. The machine has 60 stitch selections that are even and easy. You can perform a variety of stitching tasks with the nine presser feet. From quilting and embroidery to plain stitching, you can carry on many different tasks using the machine. The walking presser foot is particularly useful for professional sewers. Due to the computerized operations, owners have reported fewer errors and more precise results. An error message will be displayed when you set up the parts incorrectly. This will prevent damage to the machine. In addition, the display will tell you when to change stitches and what presser foot you should use. Some reviewers have stated that the sewing machine vibrates and generates uneven stitches. But I did not experience such a problem with this machine. The sewing machine may not work great with heavy fabrics, but it performs excellently when working on lighter fabrics. You can use the sewing machine for a lot of complex projects. From customs and clothing to crafts and blankets, the sewing machine can perform all the work spectacularly. Although the sewing machine may not have automatic embroidery function, but this does not mean you cannot embroider different designs. Brother CS6000i has great looks with rounded moody. The machine looks modern and slick. It can blend into a modern crafting room. The computerized machine has an LCD display selector. You can set a specified stitch setting using the machine. A lot of people have praised the machine for its good build and durability. The sewing machine has been around for several years. There have been very few complaints regarding the durability of the product. Brother CS6000i has lots of accessories. The number of accessories may seem to be overwhelming at first. However, these accessories provide a lot of opportunities when it comes to sewing. Novice users can use the basic feet that’s included in the machine. Expert users can experiment with button holes and blind stitches. Most sewing machines in this price range only contain a couple of things. Most probably you will get a few feet. You will have to pay a large sum for extra accessories. This sewing machine comes with everything needed for a perfect stitching job and more. You won’t have to buy extra accessories when you buy this sewing machine. One of the great things about the sewing machine is that it can be perfect for quilting. You can create a lot of quilts with this machine. The foot holder, additional wide table, and spring action quilting foot all lead to a professional job. 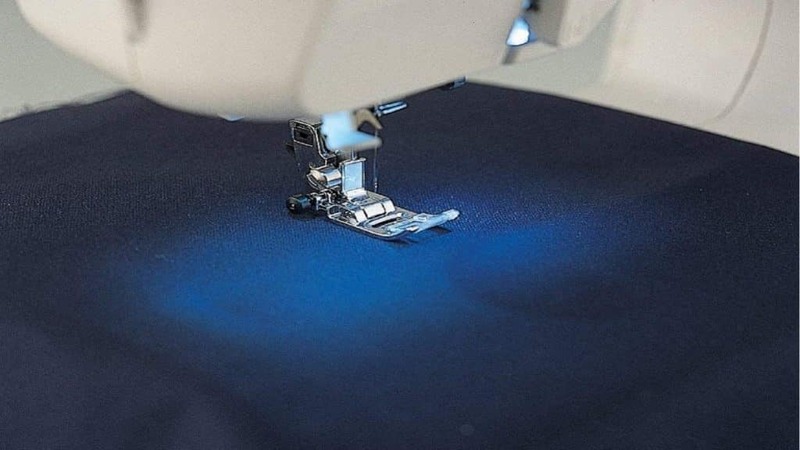 Another great feature of the sewing machine is the automatic needle threader. The sewing machine is a silky balm to the strained eyes. The feature makes it the best for beginners. You don’t have to make much effort in threading the machine. Beginners can become overwhelmed when using a sewing machine for the first time. They can become jittery due to the high speed of the sewing machine. Brother CS6000i sewing machine will allow you to ease into the project. You can adjust the settings based on what seems comfortable to you. Brother CS6000i has a lot of great features. Here I have listed just some of the best features of the sewing machine. The machine weighs only 4 pounds. It has jam resistant bobbin that is easy to set up. You can rest at ease in knowing that the machine comes with 25 years limited warranty. You can find a lot of accessories with the Brother CS6000i sewing machine. The sewing machine comes with a walking foot, quilt guide for foot holder, spring action quilting foot, overcasting foot, buttonhole foot, and zipper foot. The sewing machine also has a spring action quilting foot, blind stitch foot, bobbin, and button fitting foot. Other accessories that you can find with this sewing machine include the following. You don’t have to buy anything else when you purchase this sewing machine. The machine is well kitted out right from the box. Brother CS6000i provides great value for money. Due to the automatic needle threader, threading is simple and quick. Another reason I think that the sewing machine offers great value for money is the adjustable speed settings. Adjustable speed settings will allow you to work at a comfortable setting over the course of the project. Moreover, I find that the oversized table and free arm will make it a great choice for making quilts. As I have mentioned before, this machine is ideal for beginners. If you are starting to sew, this is the best machine to get started. The machine is not that pricy, so you don’t have to spend a lot of money on it. The jam-resistant bobbin winding, automatic needle threader and computerized display for different stitches make this machine easy to use. You can watch the video below if you want to know how to thread the needle and wind a bobbin using this sewing machine. Not only is the sewing machine great for the novice, but it’s also great for experienced users. You can select from over 60 in-built stitches, which I mean is a lot at this price point. The extra-large table and free arm allow you to make different types of sewing projects. 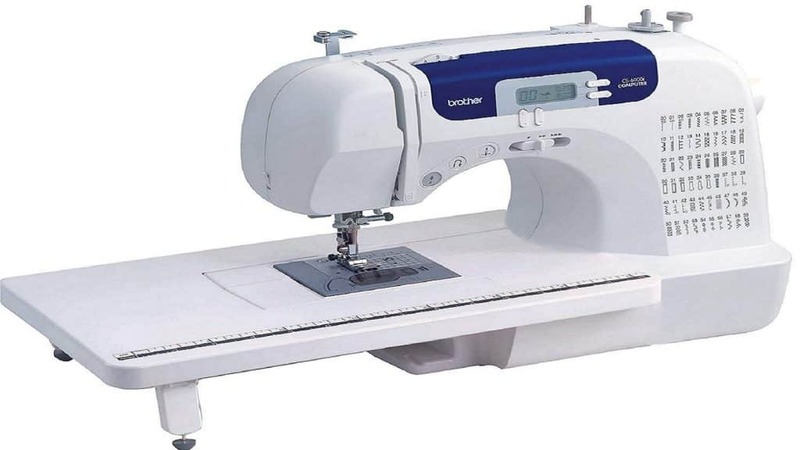 While there are cheaper machines available in the market, I believe that no other sewing machine will hold up to the features of Brother CS6000i in terms of value for money. Despite feature packed and availability of a lot of accessories, the sewing machine is priced at a lower end. Overall this is a great machine that provides excellent value for money. While the machine may not be suitable for heavy duty work, you can perform everyday projects including quilting with ease. The machine comes with a lot of exciting features that makes it great for both novice and professionals. You won’t regret your decision to buy Brother CS6000i for yourself or as a gift for your brother. Keep in mind that the sewing machine does not have automatic tension control as is the case with some other machines. However, this should not be a reason to skip this machine as setting up the tension does not take much time. You can set it up and get it running within seconds. The enduring reputation of Brother sewing machines makes it the perfect choice for all types of sewing projects. 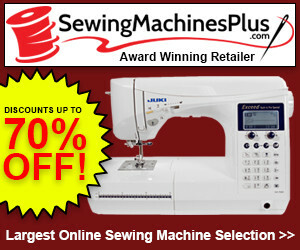 You can find the sewing machine in all the leading stores online. You can also subscribe to the Stitching Sewcial blog section to connect with the community of sewing enthusiasts. Here, people share tips, personal stories, DIY projects and more when you connect with members in the blog section. Buying the machine can one of the best decisions you can ever make. The machine comes with a lot of features and accessories. I didn’t have much to complain about the sewing machine and that’s why I recommend others to buy it for their sewing projects.